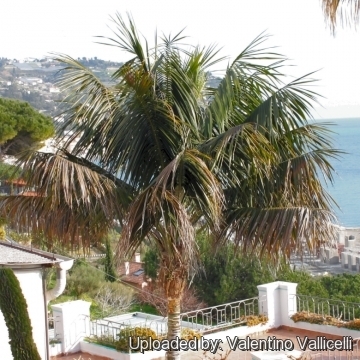 Crown, at Bordighera, Liguria, Italy. Origin and Habitat: Endemic to Lord Howe Island group, in the Tasman sea about 804 km off the eastern coast of New South Wales, Australia. It is also extensivley grown on Norfolk Island. It is used widely indoors and out as ornamental around the world. Probably it is the most widely used and most popular "house plant" of all time, dating back to the 1850s. Habitat: It is the predominant element of the sub tropical forest of the island, up to about 400 metres of altitude. The climate on Lord Howe Island is subtropical, warm to cool. ow in extensive colonies at low to moderate altitudes, less than 2870 ft (875 m) above sea level. 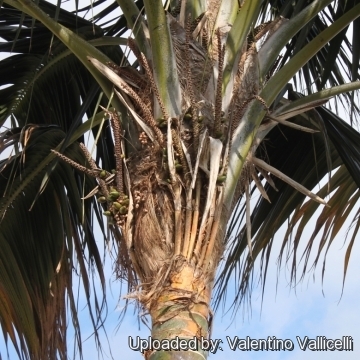 Description: Howea forsteriana is an elegant palm with long, large, arching fronds, it is slow growing, and the height may range from 4 to 9 m, and can reach 20 m in its natural habitat. Trunk: Solitary, erect, up to 18 m tall and 15 cm in diameter, bulging at the base; young stems green but turning grey with age; ring scars are oblique and prominent, raised, and undulating. No crown shaft is formed from leaf sheaths, but the leaf-bases disintegrate into a conspicuous mass of woven brown fibres. Crown: 3-7 m across, with 30-40 gracefully drooping fronds which produce an airy and poised look. Leaves: Pinnate, reduplicate, large, arching 3-4 m with long, not armed, petioles, eventually held more or less horizontally. Leaflets (pinnae) linear, dark green (lighter green on the bottom), with prominent secondary veins and yellowish midrib, rather distant, horizontal or pendulous and regularly arranged in a single plane, up to 80 cm long and 2-5 cm wide. It has distinctive glands at the base of each pinna. Inflorescence: Pendulous 1-2 m long with 3-8 spikes growing from a leaf axil. It is a monoecious species, staminate (male) and pistillate (female) flowers are produced on the same inflorescences and are white in colour. Fruit: Several en-masses, narrowly ellipsoid up to 4-5 cm long and red or maroon when ripe, maturation which takes place slowly (3-4 years), thus the same plant can present simultaneously, inflorescences and infrutescences with fruits at various stages of ripening (green, yellow, and dark red). Remarks: The similar Howea belmoreana, also endemic on Lord Howe Island, is less than 7 metres tall, has leaflets that are held in a V-shape and are dark green above and below, and grows in shade under higher trees and palms in humid forests. 5) Wikipedia contributors. "Howea forsteriana" Wikipedia, The Free Encyclopedia. Wikipedia, The Free Encyclopedia, 21 Aug. 2014. Web. 28 Aug. 2014. 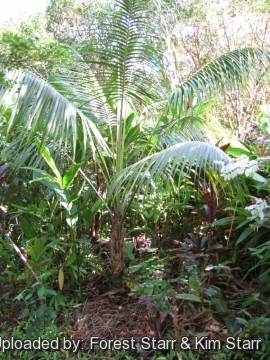 Cultivation and Propagation: This palm is an excellent relatively slow-growing garden plant adapt to different climates, from tropical to warm temperate. 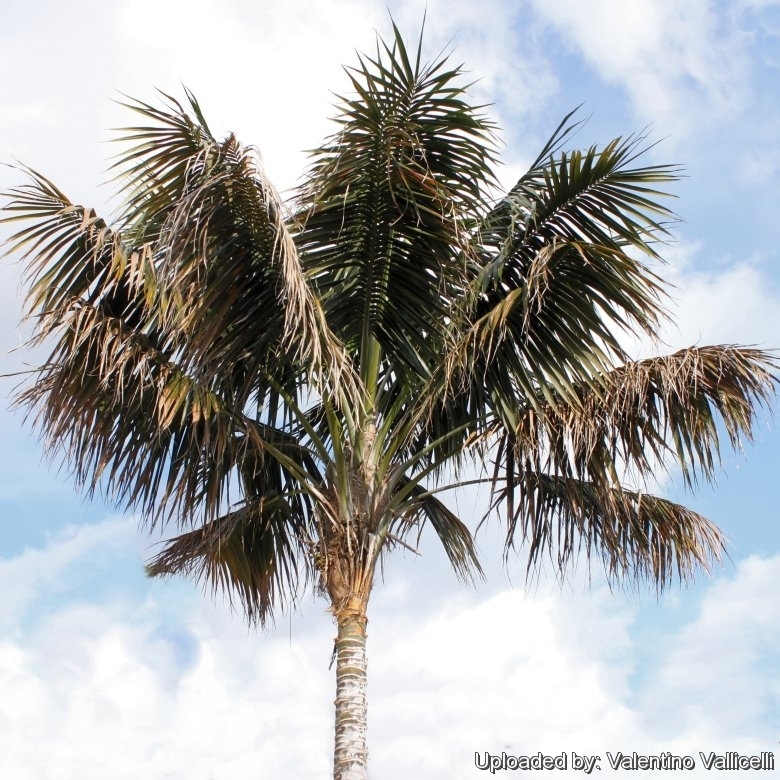 It is also one of the most elegant and one of the most durable of all indoor palms. They have an awesome track record for surviving low light, dust, central heating, rough handling, drought and general neglect. Watering: It prefers regular waterings and should be watered before the soil completely dries. This palm a will tolerate occasional dryness if not prolonged. Don't let sit in water. Indoor, potted kentias should not be over-watered. They may contract the fungus Phytophthora, if over-watered. Fertilization: Need a perfect low-release fertilizer (e.g., 18-18-18) diet including all micro nutrients and trace elements. It is subject to magnesium and potassium deficiency. Aerosol salt tolerance: They grow very well in coastal areas and are quite wind resistant.